Origin Energy picks Tendril for a pilot that could have a big payoff. Tendril recently closed its first deal Down Under, with a pilot involving 5,000 customers of Origin Energy, one of Australia's largest integrated energy companies. 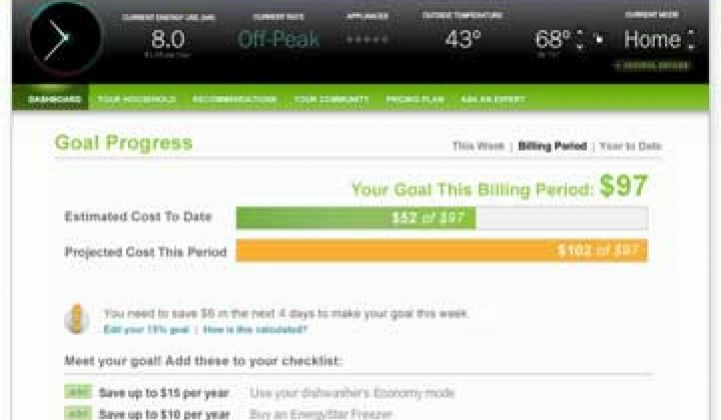 Starting in June, Origin will deploy Tendril Energize, a suite of applications developed following the GroundedPower acquisition, that will deliver tailored energy use information via a web portal, smart phones and mailings (electronic and paper). The Australian market has a lot going for it. The bulk of the country is deregulated and so retailers have to fight for their customers. The average churn rate is 20 percent, according to Phil Craig, General Manger of Origin Retail. “So we essentially have to replace our customer base every five years.” That’s no small feat when Origin’s gas and electricity customers are about 4.6 million people in a country of just more than 22 million residents. There are a lot of factors that make Australia a prime target for consumer energy management tools. First of all, Craig said bills are sent out every three months. Yes, you read that correctly -- bills only go out quarterly. Sticker shock is a common problem. Smart meters are also being deployed across the state of Victoria, and Craig said that within a decade they should be everywhere in Australia. Aussies love electronics as much as any other developed nation, but they are fiercely more aware of environmental issues than most Americans. About half a million of Origin’s customers pay for green power. Prices are also already high; Craig estimated customers pay somewhere around $0.20AUS per kWh during off-peak periods in Victoria. The utility is already offering residential solar installations, with more than 50,000 under its belt. Tendril has already expressed interest in integrating solar PV data into its offerings. Trying to create a better relationship with the customer is central to Origin, because it has to be to survive as a business in the Australian market. “Twenty percent churn rate is very expensive to maintain,” said Craig. One of the objectives of the pilot is to create trust with consumers, something that seems to be lacking with utilities worldwide.